‘Sparkling’ is a clean, modern, flat design theme developed using Bootstrap 3. The frontend framework optimizes this theme for smartphones, tablets, desktops and any other device. With pixel perfect design, awesome widgets and full-screen slider it stands out among WordPress themes. It has a premium look and feel that can’t be confused with anything in the market. The theme is SEO friendly with Schema compatible structure that will make Google love your website. The theme supports most if not all free and premium plugins such as Gravity Forms, Contact Form 7, SEO by Yoast, W3 Total Cache and many more. This is an ideal theme for personal and corporate websites in health, fitness, education, finance, business, travel, web design, marketing or any other niche. Since version 2.2.0 Sparkling theme is eCommerce ready thanks to its WooCommerce integration. We are open for suggestions on how to make Sparkling theme become the next big thing. If you feel that you know how to improve this theme even more, please let us know on support forum or via Twitter. Sparkling has dozens of theme options for additional customization. You can edit footer copyright information, change element color, setup slider, change fonts and much more. Sparkling theme supports Infinite Scroll which makes your content easy to load ‘on the fly’. For more information, please see theme documentation. Added options for sticky/fixed navigation. Removed Options Framework in favor to WordPress Theme Customizer. Be careful with this update as it might break things. Added layout selector for individual posts/pages. Other code cleanups and improvements. 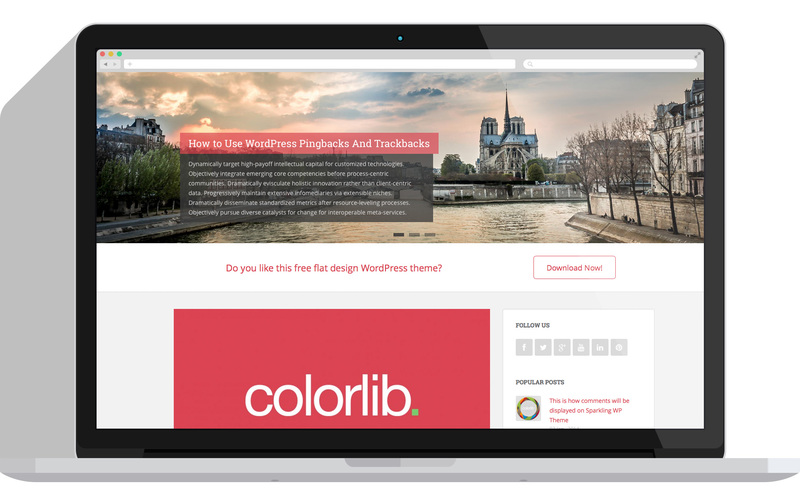 Prepared theme for WordPress 4.3 update. Fixed minor bug with attachment pages. Fixed minor bug with navigation submenu color on mobile devices. Introduced option to change full content vs excerpt for blog page. Fixed overlapping CSS selectors when using tag called “navigation”. Author box is now visible only if there is a author bio/description to show. Improved favicon functionality. Now loaded in WordPress dashboard and frontend. Added more flexibility to slider functions via functions.min.js file. Recreated logic behind color in Theme Options. Now these settings provides with more flexibility. Defined default social icon color. Fixed next/previous button placement on mobile devices. Added foursquare icon in Sparkling social widget and footer. Added different content width for full-width pages. Removed all traces from Underscore template that weren’t replaced already. Theme is still based on Underscore but removed some strings to avoid confusion.